This was a recipe I actually got from the Food Network Kitchen. I was quite impressed with the results. The moderately mild flavors of the lentils and bulghur pair perfectly with the creamy, herbiness of the tahini sauce. The pilaf requires a few steps and a handful of ingredients, but it’s really rather easy to make and is worth your time. -1/3 cup chopped flat-leaf parsley, mint, or dill, or combo. For the pilaf: In a medium saucepan, bring the water and lentils to a boil. Adjust heat to a simmer, cover, and cook for 15 minutes. Meanwhile, fry the onions in olive oil over medium heat until well browned, about 12 minutes. (If onions begin to stick, add a few Tbsp. of water). Season with salt and pepper, to taste. To the pan with the lentils, add the onions, bulghur, and 1 1/2 tsp. salt. Bring to a full simmer, cover, and cook 5 minutes. Remove from heat and let stand for an additional 15 minutes. 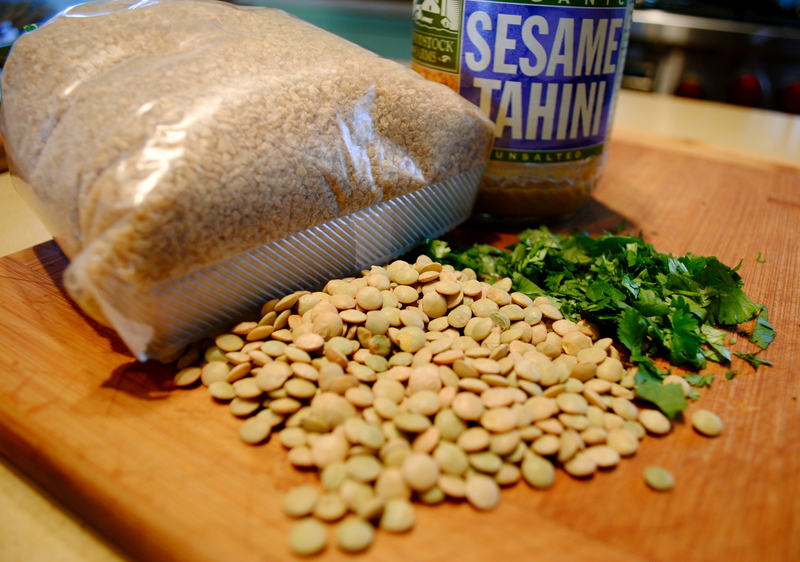 While the mixture is standing, make the tahini-herb sauce by pureeing all ingredients in a blender of food processor. (I found that a food processor worked best). Transfer pilaf to a serving dish and top with tomatoes and herbs. Serve with drizzled tahini-herb sauce over top. This sounds awesome. I love that you reduce the olive oil from 1/2 cup to 3 Tbsp. Sometimes recipes that aren’t made specifically to be healthy use fats in excess when you can easily cut down. This looks like a fantastic recipe! I was just looking around for a recipe that included tahini! Thanks!! I love what you have done here….complex carbs, protein, healthy fats. Awesome combos!! The tahini herb sauce is the perfect topper! That certainly sounds delish. Thanks for the recipe. This is a nice take on a Lebanese traditional mujaddara. I am glad you liked it! Mmm, great recipe. Do you know I have never made a Food Network recipe? Unless you count Alton Brown’s cookbook (which actually you should..). But I have never used abything other than Alton’s recipes. It’s crazy because I watch the Food Network all the time! This recipe sounds so good. Especially that sauce! Cool picture. And love your whole-wheat kick. I’m on one myself!